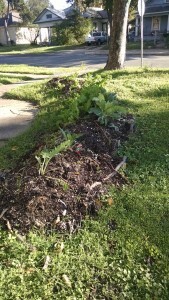 As the weather turns colder, we are getting serious about growing food for the winter. Yes, we can grow year-round in the DFW area. 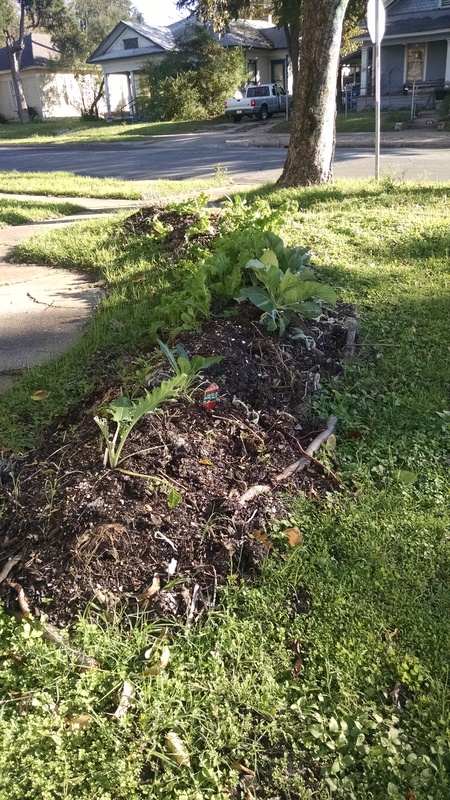 The hugelkultur bed out front is covered with greens – mostly mustard and collards, with some chard. The mustard is taking over and is now soaking up the wonderful light drizzle. Meanwhile, the greenhouse has been reassembled and tied to the deck out back. It will allow us to start seeds for herbs for the spring, as well as cultivate Malabar spinach from cuttings we obtained a month or so ago (the porch kitties keep trying to eat our attempts to start it on the front porch!). 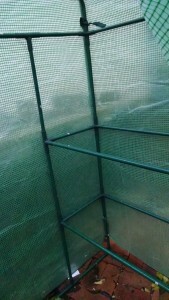 The greenhouse (a Gardman) is a kit that I bought a couple of years ago, then stacked and stored sometime last year. It is compact, and stores in a minimal space when not in use. It is remarkable for a kit – in February 2014 when it was freezing outside, I unzipped the door and walked into a warm, humid environment. Not exactly 60 or so degrees, mind you, but certainly very much above freezing and seedlings were thriving. 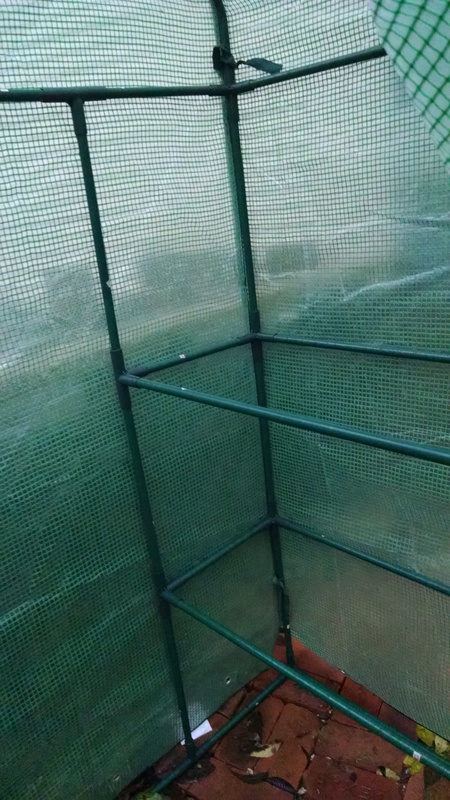 One caution on greenhouses – when it rains, the plants do not get water! Now that might seem intuitive, but I speak from experience – I keep a watering can inside the greenhouse for dowsing seedlings. 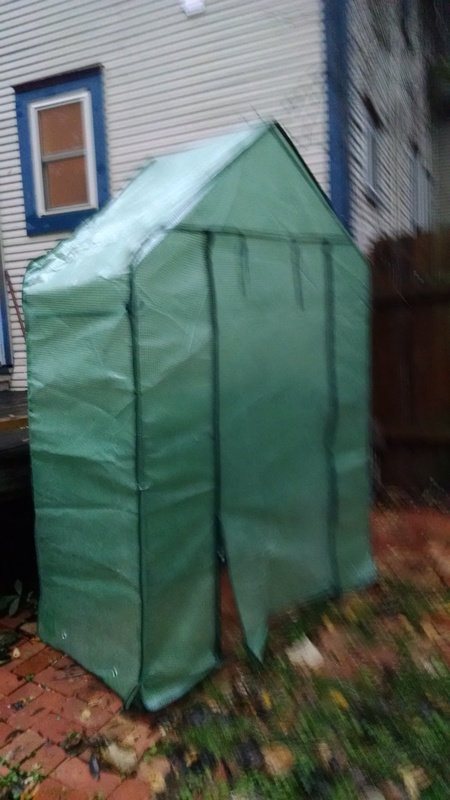 Posted in garden, greenhouse, greens, hugelkultur, mustard.